The Elo Interactive Digital Signage (IDS) touch platform featuring the Intel® Core™ 4th Generation CPUs with enhanced graphic engines enables increased customer engagement and immersive brand experiences by adding an exciting new dimension to traditional broadcast digital signage - the power of touch. Elo's ECMG2B computer modules, available for use with the Elo 3201L, 4201L, 5501L and 7001LT IDS touchscreens are well-suited for interactive media delivery and online collaboration for modern office environments. The computer modules are easily installed into the IDS display - avoiding costs of in-wall installation of a traditional player or PC. 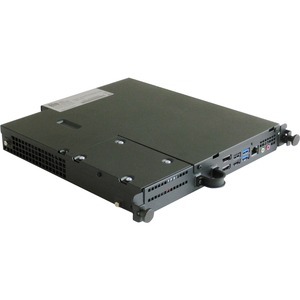 Computer modules are available in a choice of three models: ECMG2B-i3 based on a 3.40GHz Intel® Core i3 processor and HD4400 graphics; ECMGB2-i5 based on a 3.70GHz Intel® Core i5 processor and HD4600 graphics; and ECMG2B-i7 based on a 4.00GHz Intel®Core i7 processor and HD4600 graphics.